Barbecue Master: Ho! Ho! Ho! Who forgot to check the weather forecast so grilled in the rain? Ho! Ho! Ho! 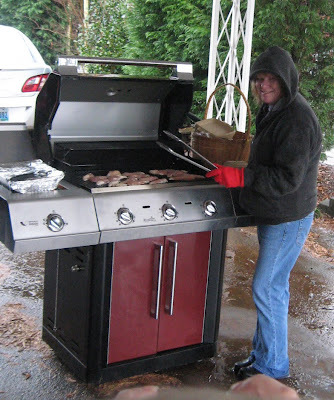 Who forgot to check the weather forecast so grilled in the rain? Yes! This was my idea. I thought it would be so much easier to grill for Christmas. OH yes. Forget the marathon in the kitchen. Toss some chicken and hot dogs on the grill and spend the day hanging with the fam instead of cooking, cleaning, and stressing. Did I check the weather report before I tossed out this idea? OH NO! Of course not. Ever the optimist, I anticipated one of those North Carolina 70degree winter days. We do have those in NC - honest. 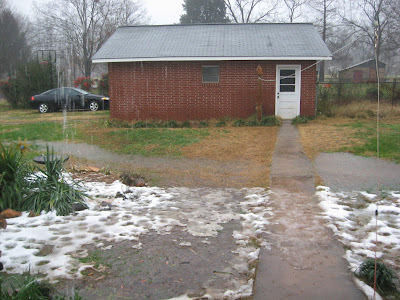 It, of course, started pouring the rain last night and on through the entire Christmas day. This was with 40 degree temps and wind. But, hey I'm a sport. I lugged the barbecue stuff out to the truck. Then, I got my boots and dry socks, since the yard flooded, and one trip to the truck soaked my tennis shoes and socks up past my ankles. I would tell you how gross that felt, but I am sure you can guess. With help from the guys and with dry feet, I fired up the Big Red Char Broil infrared grill which worked like a charm. 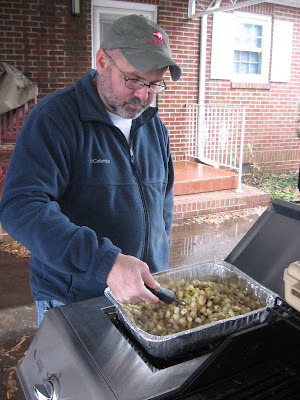 The side burner on the Big Red grill has more power than most and worked out great for the grilled hash browns which we usually put on the grates (when not cooking for a bigger crowd). These grilled hash browns are the boys' dad's specialty, and he got the recipe for a buddy in the Navy who called these Butter Tators. He, of course, used 3 or 4 sticks of butter, and we healthy it up just a little with only about one stick of butter (with two bags of hash browns here). The boys go wild for the Grilled Hashed Browns and always request them. They are most yummy, I must say. 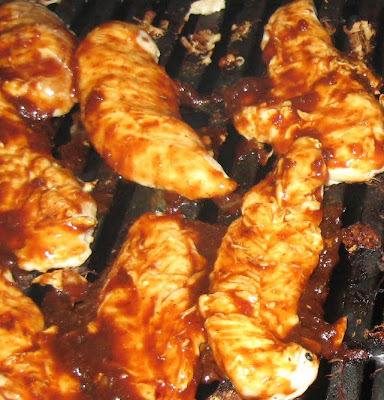 I did the grilled chicken boneless, skinless chicken breasts and used Chef Hymie Grande Sauce. My new step dad is diabetic, and Chef Hymie Grande BBQ carries the national diabetic seal. That's a good reason to select that for a family cook out, but it's also a small batch BBQ sauce with natural ingredients and tastes great.